were in the Google Apps Sandbox showing the products and custom solutions they’ve integrated with Google Apps. In case you weren’t able to see the Sandbox firsthand, we want to share a couple videos from these companies to spread their knowledge and excitement with the rest of the ecosystem. Assistly is a customer support application from small to medium size enterprises, integrated with Google Apps Single Sign-On, Gmail and social networks and available for purchase on the Google Apps Marketplace. Assistly is one of many great business applications which make the vision of 100% Web viable today. Cloud Sherpas is a Google Apps reseller that helps companies migrate to Google Apps and fully utilize the suite of web-based collaboration tools. They’ve also built SherpaTools on Google App Engine, a corporate contact management and IT administration tool for Google Apps available for purchase on the Google Apps Marketplace. We’ve also created video case studies of 17 additional companies who are innovating using other Google technologies, such as App Engine, Chrome/HTML and Android. Check out the full playlist on the GoogleDevelopers YouTube channel. The Google I/O Developer Sandbox is an annual tradition that gives innovative developers a chance to showcase their companies and technologies to others at our developer conference. This year, 24 companies were in the Google Apps Sandbox showing the products and custom solutions they’ve integrated with Google Apps. In case you weren’t able to see the Sandbox firsthand, we want to share a couple videos from these companies to spread their knowledge and excitement with the rest of the ecosystem. team would like to get feedback from the developer community on your experience with the Marketplace and what you think can be done to improve it. Please fill out the survey below if you have an installable app on the Marketplace (using the Add it Now blue button), are actively building an installable app or previously had an installable app on the Marketplace. Most questions are optional, so please provide the feedback most important to you even if you don't have time to complete the whole survey. We'd also like to offer the opportunity to speak 1:1 with the Google team about your Marketplace app. If you're interested, please provide a proposed agenda at the end of the survey. If you do not see the survey embedded above, please visit the form directly. The Google Apps Marketplace team would like to get feedback from the developer community on your experience with the Marketplace and what you think can be done to improve it. Building UI in Apps Script just got a whole lot easier! is the Ui service. 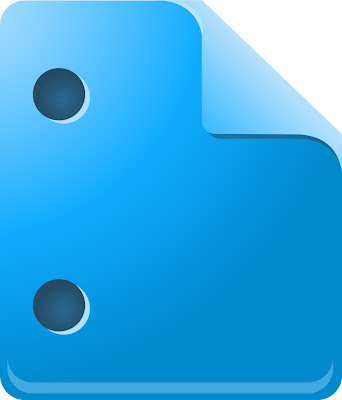 UiApp lets you build a professional looking web app in just a few lines of code. Some of our users have built incredibly complex apps this way, all hosted by Google and running in any modern browser. For a lot of users, though, UiApp seems a bit daunting. It can be hard to visualize how small changes to your code affect the look of your app, or how adding a component in one place of the UI can shift the positioning of a component in another place. We know what that’s like - we write scripts too! That’s why we’re excited to unveil the new Apps Script GUI Builder. 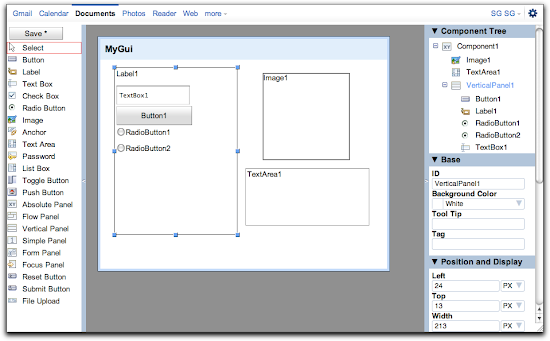 The GUI Builder lets you construct user interfaces for your scripts quickly and easily. Simply draw the application, set some properties, and you are ready to go! You can use a GUI you’ve constructed this way inside a Spreadsheets dialog, on a Sites page, or as a standalone web service at its own URL. The new loadComponent method loads your GUI and makes it available to the app. Then you can add it to the app like any other component. You can also add it inside another panel, instead of at the root of the app. GUI Elements created in the Builder behave exactly as if you had created them in code. If you want to reference them in a script, you can do so with the app.getElementById() method. Every element from the GUI will have an ID property (you’ll see it in the GUI Builder) and you can use those to reference components and change them. For example, in the code below we are changing the text color of a button to red. You can reference individual elements from each copy using these prefixes. “Button1” becomes “aButton1”, and so on. Once you’ve built a GUI, you can can enable your app as a web service from the Share > Publish as Service menu in the script editor. That will give you a URL for your app, and you’ll see the GUI you built right away! You can also show a GUI inside a spreadsheet using the sheet.show() method. The GUI Builder currently supports a subset of UiApp widgets, but you can expect that set to continue to grow until all widgets are supported. In the meantime, you can augment a GUI with code, as is demonstrated above. We’ll also continue to improve UiApp - we’ve been listening to your feedback, and we have a lot of excited things planned. GUI Builder can be accessed from the Apps Script Editor. Click File > Build a user interface and start building interfaces. You keep building great apps. We’ll keep making it easier. One of the most useful parts of Apps Script is the Ui service. UiApp lets you build a professional looking web app in just a few lines of code. Some of our users have built incredibly complex apps this way, all hosted by Google and running in any modern browser. as part of the Who's at Google I/O series. We don't normally cross-post one month later, but we think this post will be very valuable for Google Apps Marketplace developers evaluating their mobile strategy. This guest post by Cameron Henneke originally appeared last month on the Google Code blog as part of the Who's at Google I/O series. We don't normally cross-post one month later, but we think this post will be very valuable for Google Apps Marketplace developers evaluating their mobile strategy. stores tasks that users enter via Gmail, their mobile device, calendar, or iGoogle homepage. The Google Tasks API provides developers with a powerful set of API endpoints for searching, reading, and updating Google Tasks content and metadata. Create a simple App Engine app using the Google APIs Client Library. 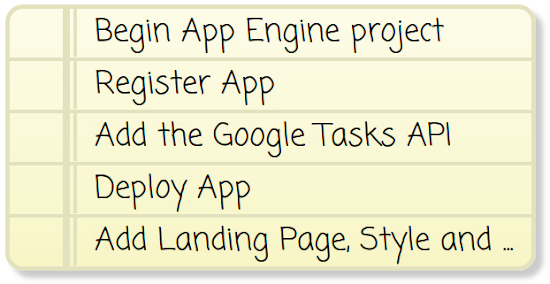 Provide Google Tasks users a mechanism to authorize your app to access their tasks. Make authorized requests to the Tasks API. Check out the tutorial and ask any questions you have in the Google Tasks API forum. Johan joined Google in 2011 as a Developer Programs Engineer based in Zurich. He is currently focusing on App Engine and Google Apps APIs. Before Google, Johan was providing development services as a Freelancer around FLOSS. Last month, we launched the Google Tasks API, which received a very warm welcome in the developer community. Google Tasks stores tasks that users enter via Gmail, their mobile device, calendar, or iGoogle homepage. The Google Tasks API provides developers with a powerful set of API endpoints for searching, reading, and updating Google Tasks content and metadata. for many of the administrative APIs last September. Among the many benefits of OAuth is the ability to provide access to Administrative APIs without exposing admin usernames or passwords. While the Provisioning API has featured OAuth support for some time, we're excited to announce that developers now have even more control over access to the API. The Provisioning API now has four separate OAuth scopes - one each for the users, alias, organization units, and groups methods. For example, this means that developers can enable an application to have access scoped to only groups and not user data. For more information about the new scopes, please see the authorization section of the Provisioning API Developer's Guide. The previous Provisioning API scope is now deprecated, and new applications should reference these new, more granular and secure scopes. While the previous scope will still work for your existing scripts during the deprecation period, it will eventually not produce valid request tokens. We strongly encourage Google Apps developers to update your applications to take advantage of this security improvement. Provisioning isn't the only Google Apps API with recent security improvements. We're also happy to announce that developers can now authorize use of the Reporting API via OAuth! Now Google Apps developers can start building secure automated reporting and dashboard applications without worrying about managing ClientLogin tokens. Check out this article for more information about using OAuth with the Provisioning and Reporting APIs. 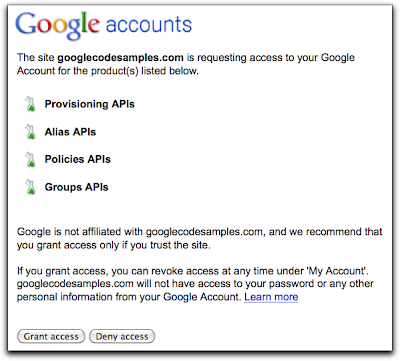 Google Apps APIs are not only designed to use open web standards, but also to be very secure and reliable. In our efforts to improve security, we launched OAuth support for many of the administrative APIs last September.